Today's word is haughty. Certainly not because I'm haughty -- I'm as down to earth as they come. It's today's word because I just like the sound of it, and the vision it invokes. We don't see a lot of haughtiness nowadays. Today's women tend to complain, or clutch their pearls, but haughty? Not usually. Of course, I don't travel with the upper crust, who I'm sure probably do still have the skills, but the new money girls like Paris or the Kardashians? Not so much. Maybe the closest thing I see on TV would be the Loreal commercials where the girl claims she's worth it -- at least that's some modicum of haughty. Haughty means "how dare you." It means "if looks could kill, you would no longer be here." Haughty means "you are beneath me and my daughter, you hapless boor." It's not a pretty thing, and certainly not a trait that we covet, but there's something to be said for haughty. 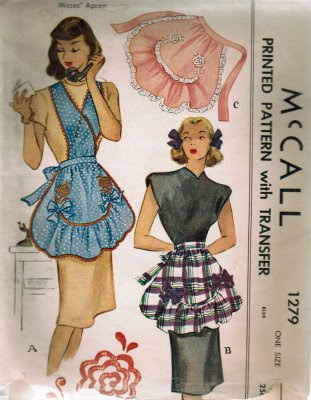 I see haughty girls on the pattern envelopes every now and again. 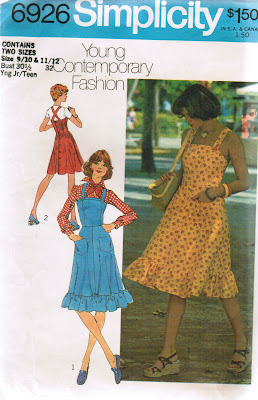 It's usually Vogue or Modes Royale, like this one, but if you go back far enough, you can even find haughty on an occasional Simplicity pattern -- usually with the Haughty One wearing a hat. So today, let's get in touch with our inner Haughty -- not hottie, lest you be confused. Put on a great dress and maybe a fine little hat, throw your shoulders back and show the world you're worth it! Many fans of aprons have probably seen this writing. I got it in an email some time ago, and forwarded it to my mom. She was never a big apron wearer, but she was 8th (or 9th, I never can remember) of 18 kids in her house -- all from the same parents -- and she remembers Grandma using her apron for almost every one of these. What do you think? The principal use of Grandma's apron was to protect the dress underneath, but along with that, it served as a potholder for removing hot pans from the oven. It was wonderful for drying children's tears, and on occasion was even used for cleaning out dirty ears. From the chicken coop, the apron was used for carrying eggs, fussy chicks, and sometimes half-hatched eggs to be finished in the warming oven. When company came, those aprons were ideal hiding places for shy kids. And when the weather was cold, grandma wrapped it around her arms. Those big old aprons wiped many a perspiring brow, bent over the hot wood stove. Chips and kindling wood were brought into the kitchen in that apron. From the garden, it carried all sorts of vegetables. After the peas had been shelled, it carried out the hulls. In the fall, the apron was used to bring in apples that had fallen from the trees. When unexpected company drove up the road, it was surprising how much furniture that old apron could dust in a matter of seconds. When dinner was ready, Grandma walked out onto the porch, waved her apron, and the men knew it was time to come in from the fields to dinner. It will be a long time before someone invents something that will replace that "old-time apron" that served so many purposes. If you want to make one of your own, click on the image. Girls these days just don't know what they are missing in the lingerie department: slips. If you asked my daughter, she probably didn't know what a slip was till she was at least 12, and still probably doesn't see the sense in one. And mention that "it's snowing down south," and they will have absolutely NO clue what you're talking about. Well, I say it's time to resurrect the slip. Sure, we've seen Courtney Love and even Kurt Cobain perform wearing a slip as outerwear. We've seen Madonna dancing around singing "Like a Prayer" wearing a red slip. But what about the slip as an undergarment, worn as intended? I'll admit, when I was little, I just hated wearing slips. They just felt like they got in my way, didn't fit right, or just made me overly hot. But then when I think about all the times I saw my mom rushing around in her slip to get ready for church, it makes my heart warm. You see, we were a zipped up family -- you didn't show yourself at breakfast in a nightgown. You had to have your bathrobe on and zipped all the way up. Imagine what a difference it was to see Mom getting prepared for an evening out, doing her makeup while wearing her slip. And silky? The older slips feel nothing like modern ones, that always snag and feel rough. The old slips could've convinced Linus to switch from a blanket to a slip, that's for sure. I could tell a vintage slip from a modern one with my eyes closed, just by feel. There's just no comparison. So if you want to harken back to your younger years, or just bring up some memories, buy a slip -- or make one, because it's not hard. It'll bring a smile to your face, guaranteed. Every year, Indianapolis sponsors a celebration of Earth Day on the Saturday closest to the actual day. Held downtown, it's a fun day of finding out ways to help out the planet. My youngest son plays in a drum group that has performed at the Earth Day celebration for three years running. I love listening to them play there, especially because they get to play with Village Drums, the local adult group who can really rock a beat. If you've never been to hear a drum circle perform, try it. It's amazing. the moment when the guy next to me rolled off his chair and did a face plant right onto my foot. Rather shocked me, but he seemed nonplussed when I rolled him over and asked if he was ok. "Oh yeah," he said, "I have arthritis." I never did quite understand that, but he didn't seem shook up about it, so we hung around for a while to make sure he was fine, then moved along. I came home with two trees -- one is a cypress that needs ground much different than our yard, so we'll have to find it a happier home. The other is a white pine, which we can hopefully find a place for in our yard. All in all, a nice way to celebrate the earth, and enjoy a beautiful day in Indianapolis, and to wear a dress like this one , which I strongly suspect is the same one I made in my sophomore year of high school. Nowadays, I'd have to tuck some smelling salts into the pocket, to revive errant men who want to take naps on my feet. Click the image to shop. Summer's coming, and one thing's for sure -- halter's never go out of style. I read somewhere once that Elizabeth Taylor wore a lot of off shoulder type dresses in the 80s because, as her stylist said, "women with curves have beautiful shoulders," or something to that effect. You know what that means? Any one of us can get away with a halter look, no matter the size or shape. Halters have been around for a long time, long before my sisters and I were turning scarves into halter tops in the 70s -- something that appalls my conservative, jeans and Tshirt daughter. Thinking back, maybe it was rather bare, but things were different then, and girls showing backs and shoulders then were still showing considerably less than many of the girls nowadays. The question is, can a working woman get away with a halter look at work, and the answer is a definite yes! Take the pattern pictured above, for instance. This is a wonderful example of a day to evening look. If you wore it as pictured with the jacket while you're at the office, no one would be any the wiser. It's a great look for someone like me, who is usually chilly in office air conditioning. Got a dinner engagement after work? Just take the jacket off, add some gold bracelets, and you're ready to go! It's a timeless look from the 30s that will carry you right into the 21st century without skipping a beat. Got a favorite halter top or dress? Tell me all about it in the comments. 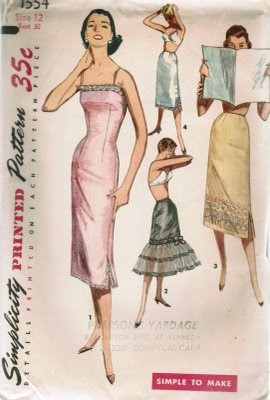 Click on the image to purchase the pictured style, or search keyword halter at the Vintage Fashion Library -- we've got tons of styles there to please everyone. I had an email last night from a charming girl who is interested in scholarships for Fashion Design. Having a daughter who is starting college in the fall, I can truly feel her pain. College isn't cheap these days, and everyone is on the lookout for help. My daughter is going to major in Zoology, and even with her animal activism from a very young age, it can be hard to find scholarships for a specific area of interest. 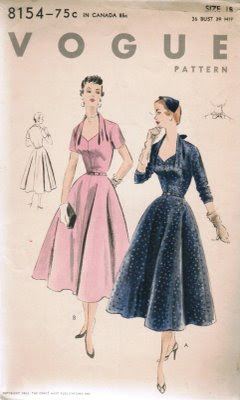 The student who wrote me sounds talented -- she's going to cadet teach Fashion Design next year, and designed her own prom dress -- wish I'd asked for pictures, darn it -- so I referred her to The Costume Society of America and USITT. Does anyone else have any suggestions on somewhere that offers budding designers some cash to help them follow their dream? Of course, all of this talk of designing makes me think of Project Runway, which seems to have finally worked through their legal issues and will be back this summer. I can't wait, because this girl can't ever get enough of Tim Gunn and his proteges, making it work. And while we're waiting, if anyone knows of fashion design scholarships, let me know, and I'll pass the info along to my contact, and give YOU a free pattern. 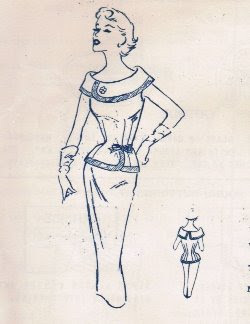 Maybe she'll design something fabulous, like the dress shown above. Click the image to shop.